We've lost a legend in Indian Motorcycles and Orange County. 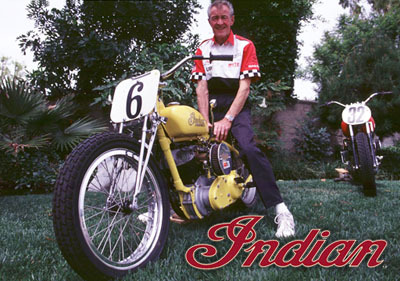 Bob Nichols was well known and respected for his racing parts and Indian Motorcycles. Since 1940 until 2018 Bob had been involved in motorcycle and automotive performance and engineering and manufacturing parts for the motorcycle, automotive and aircraft industry. Jim Ottele is going to continue to ride the Bob Nichols Racing Team yellow Scout throughout the 2019 season. Currently he has plans to race all over the country. 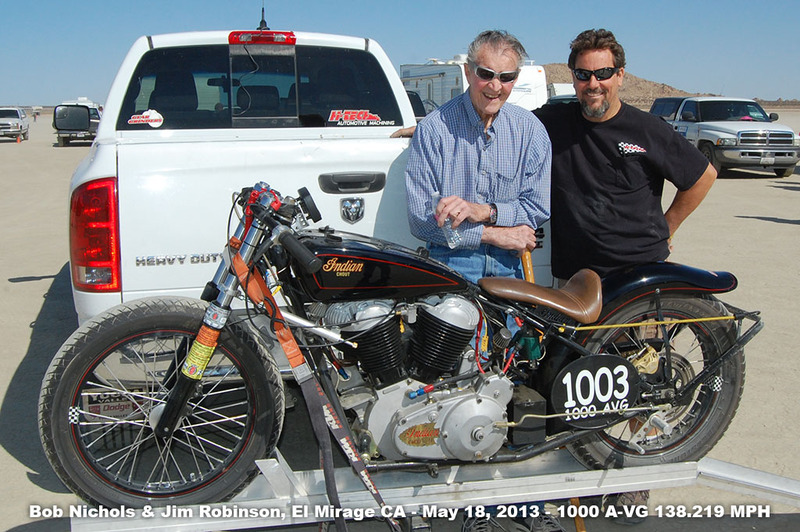 El Mirage, California - Jim Robinson set a new World Record at El Mirage Dry Lake on the weekend of May 14-15, 2016 with his nitrous powered Indian Chief of 149.98 MPH. His top speed was 151 MPH. He was using Bob Nichols aluminum connecting rods along with cams and lifters. 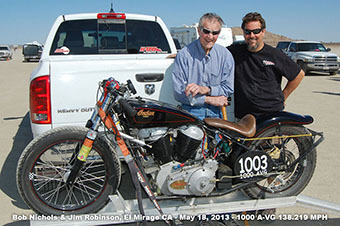 El Mirage, California - Jim Robinson set a new World Record at El Mirage Dry Lake on May 18, 2013 using gasoline on an Indian Chief of 138.219 MPH. He was using Bob Nichols aluminum connecting rods along with cams and lifters. This record was established about 1949, 1950 by Max Breback, however, he had one advantage that we did not have that is four cams in place of two cams. Bob Nichols aluminum rods allowed his RPM to be increased from 4800 RPM to 7700 RPM, and of course our two cam design was even better than the original four cam design which was 63 years ago.